The massive underground reservoir is the main gas storage site in the region, waiting to be drawn down when there isn't enough flowing in the utility's network of pipes to meet daily needs. 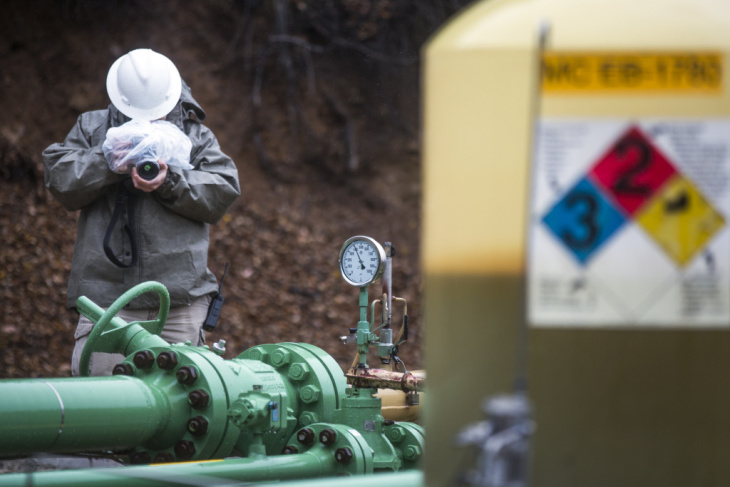 While the state Division of Oil, Gas and Geothermal Resources has certified the Aliso field safe to operate, the California Public Utilities Commission has limited the amount of gas to be stored or withdrawn from the underground reservoir. That leaves Los Angeles residents with only the gas in the pipelines — even in times of high demand, like winter — although the Aliso Canyon gas could be used in an emergency. But there's another glitch in the system. SoCal Gas imports most of our gas from out of state. The company has had a long-lasting outage on one of its lines. Two others are operating at lower capacity. It's so serious, state Energy Commission and Public Utilities Commission officials have asked if the utility can bring in gas on pipelines from the Otay Mesa area near San Diego. The bottom line, according to the report, is that if there is a streak of unusually cold days this coming winter — the kind that's likely to occur just once every 10 years — SoCal Gas would not be able to meet the demand, even if it withdraws gas from the Aliso Canyon storage field. By the numbers, SoCal Gas needs 4.9 billion cubic feet of gas during that kind of cold streak, but it has access to only 4 billion cubic feet. If there is a shortage, the company can cut off the supply to local gas-burning power plants and other big users who buy their own gas and transport it on the SoCal Gas pipe network. The last customers it would cut off would be homes and small businesses, because they are direct customers of SoCal Gas. Also, it would be too laborious to restore thousands of small customers' pilot lights and gas service. SoCal Gas will be pushing customers harder to install internet-connected smart thermostats that can reduce temperatures by a few degrees to save gas when the company needs to reduce usage. The PUC on Oct. 25 will vote on a requirement for SoCal Gas to increase the number of smart thermostats from the 9,000 it installed in customers' homes last winter to 50,000 this coming winter. SoCal Gas is offering $75 rebates to buy the smart thermostats, and an additional $75 for first-time enrollees in the temperature reduction program. Eligible brands are Nest, Honeywell, ecobee and possibly a few others, if state utility regulators approve, said company spokeswoman Melissa Bailey. Customers who were in the program last year can get an additional $25 rebate. Correction: This story has been updated to note that state oil and gas regulators consider the Aliso Canyon Natural Gas Storage Facility field safe to operate.